Eating out with diabetes can be stressful. Restaurants are in the business of selling food, not helping you stick to your diet. So, when you're eating out, you'll see, smell and hear about foods that you'd probably like to eat. It's sometimes easier to stick to your meal plan when you're eating in a more controlled environment, like your own home. Still, it is possible to eat out and not blow your diabetic diet. 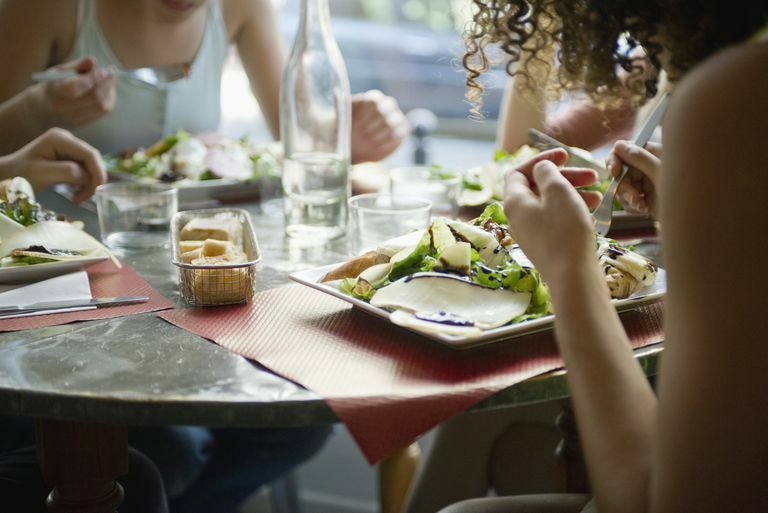 Here are some strategies and food suggestions for sticking to your diabetic meal plan when eating out. Think ahead about what you might eat before you arrive at the restaurant. If you are familiar with the menu, review it in your head and try to narrow down your options before you arrive. If you're less familiar with the menu, see if you can find it online or call ahead to inquire about it. It's easy to find something on a menu that you want to eat, but it takes longer to find something that will both satisfy your cravings and be compliant with your meal plan. Spending some time thinking about it ahead of time should help you to make a smarter food decision at the moment. For sit-down meals, build your meal by using the plate method. First, pick your lean protein (fish or skinless chicken breast), next your vegetable, fruit, low-fat dairy, and starch. When your food arrives, check that the portions match the plate method directions (1/2 your plate should consist of vegetables, 1/4 lean protein, 1/4 starch and a fruit and a low-fat dairy). If there is excess, ask for a doggie-bag and package up the excess food before you start to eat. If it isn't already posted, request nutrient information on the menu items. It is becoming more common—even required in some cases—for restaurants to provide this information. Knowing the exact amount of calories and carbs in the menu items can help you make an informed decision about what to eat. Pizza: See if there is a garden or house salad that you can order to eat alongside your pie. Review lists of possible vegetable toppings rather than high-fat meats. Skip the extra cheeses. Limit yourself to 1 large or 2 small slices, and choose thin-crust if it is an option (to cut the carbs). Subs: Look for turkey, lean ham, or roast beef on whole-grain bread. Review lists of possible vegetable toppings, and request a lot of them. Use mustard and vinegar for spreads instead of oil and mayonnaise. Fast Food: Grilled chicken pieces or sandwiches on whole-grain, 100-calorie menu options, snack wraps, salads, and low-fat yogurt items are all good choices. Steer clear of fried foods and salads that have cheese or meat on them. Taco salads are usually higher in fat—opt for a baked potato and small chili instead. Ask for substitutes if they aren't offered (e.g., the apple slices instead of the French fries). Soup/Sandwiches: watch out for the cream soups and skip the bread bowls. Look for soup/sandwich/salad combo meals. Choose broth or tomato-based soups, whole grain breads with mustard instead of mayo, and remember to ask for your salad dressing on the side. American Fare: Start off with a salad with dressing on the side, or vegetable soup. Look for grilled chicken or poached fish entrees -- avoid fried and battered options. Don't eat the skin if the chicken comes with the skin still on it. A burger without cheese and with tomato and lettuce is a good option; also look for turkey or veggie burger options. Add on 2 vegetable side dishes (eg., steamed green beans, broccoli, or spinach) and up to 3 servings of low-fat carbohydrates (eg., steamed brown rice, baked sweet potato, whole-grain bread, corn, fruit, low-fat milk). Avoid mayonnaise, cheese, "special sauces," bacon, deep-fried foods of any kind, club sandwiches, ribs and fatty cuts of meat, french fries and gravy. Don't be afraid to ask if foods can be steamed instead of fried, or cooked with less fat. Italian Fare: Skip the bread basket. For appetizers, avoid bruschetta, garlic bread, antipastos that are marinated in oil, deep fried calamari, stuffed clams or mushrooms, and stuffed artichokes - instead, ask for grilled calamari, salad with the dressing on the side, or a caprese salad. Choose dishes served in a broth or tomato-based sauce rather than a cream sauce. Ask for less butter to be added to dishes like chicken picatta or chicken marsala - sauces for these dishes can have added fat. Best to also skip the heavier dishes like risotto and lasagna. The best bet for entrees at an Italian restaurant is to stick to the grilled fish and meat specials, and to ask for veggies on the side instead of pasta. Mexican Fare: Good appetizers might include salad or black bean soup. For main courses, order grilled fajitas with beef, chicken, seafood, or the grilled fish or meat special with rice and black beans on the side. Avoid extra cheese, sour cream, fried hard taco shells and chips, nachos, chimichangas, creamy chowders, chili con carne, refried beans and fried ice cream. Asian Fare: For appetizers, choose miso, wonton or hot and sour soup, salad, edamame, or steamed dumplings. For entrees, try teriyaki chicken breast, sushi and sashimi, stir-fried beef, chicken, shrimp or tofu, and steamed rice and vegetables. Avoid fried spring rolls or dumplings, vegetables and meats, tempura, and breaded cutlets of meat. Peanut sauces also may pack more fat. Most establishments will also allow you to request that any entree be steamed (if it is usually cooked with oil), and the sauce can be served on the side. Brown rice is also usually an option.